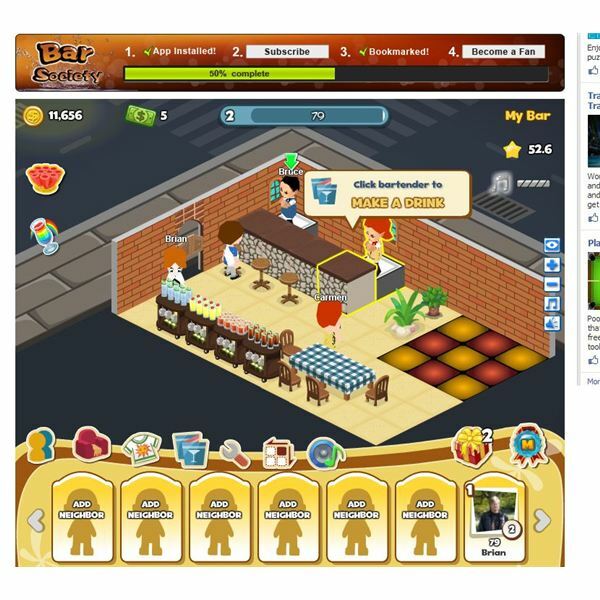 Bar Society takes the idea of game such as Nightclub City or Café World and lets you open your own bar. The game uses your Facebook friends as the bartenders who make up the drinks to be served. Buy drink carts, serve your drinks, some tables, a dance floo,r and your ready to party. You can expand your bar with some Facebook friends or game cash. You can make more drinks by buying additional bar counters for your friends to prepare drinks on. Each drink will take a specific amount of game time before it is ready to be moved to a cart and served. While your waiting for drinks to be ready you can decorate your bar with chairs, tables, plants, flooring, wall decorations, windows, and doors. There’s a nice mix of decorative options in the game so you can always have a fresh look in your bar. Bar Society doesn’t offer anything new in this style of game play and it has all been done before. The problem with bar society is it looks terrible graphically. There isn’t anything really new in the game to do. The soundtrack doesn’t do anything for the atmosphere as well. You would expect something more upbeat for a bar but all you get is a lame bass and drum beat in the background along with a few bar noises. You can change the music but you need a large amount of Facebook friends playing the game. The Caribbean rock track is a bit better than the default bass noise. This isn’t one of Playdom’s better titles such as Social City. The idea of running your own bar seems like it would be fun but this game just doesn’t add any atmosphere to the experience that you would expect. Other problems include the large amount of game cash you need to buy various items. Even the items that use game coins are quite expensive. You do start with a nice chunk of coins but these quickly disappear. Many Facebook games offer at least one free expansion without needed Facebook friends. This game requires you to have one Facebook friend for even the smallest expansion making this requirement a huge disappointment. 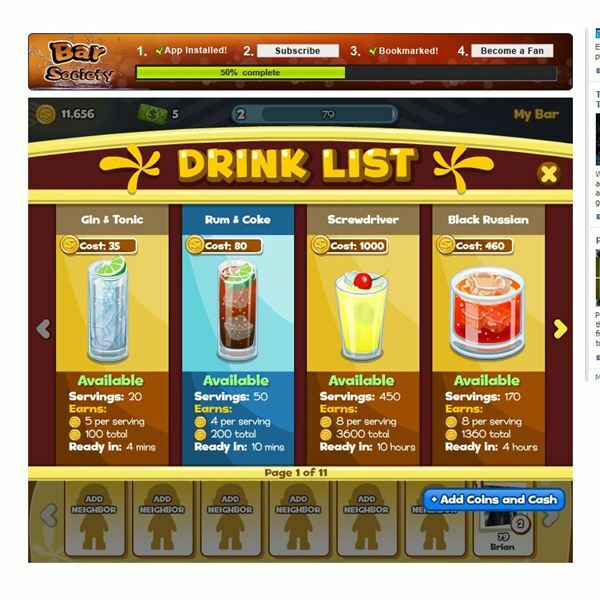 To its credit the game does offer a whole host of drinks to serve such as black Russians, screwdrivers, long island ice teas, margaritas, and the paralyzer to name a few. As you level up more drinks will become available for serving to your quests in your bar. More expensive drinks will yield more servings but will take longer to prepare by your bartenders. To serve them be sure you have free drink carts available. Bar Society has a long way to go before it becomes a great Facebook game. While the genre might be different it doesn’t offer up naything new to the experience and the poor graphics and overall game play are a big disappointment. With some fresh graphics and some free items that weren’t so expensive for new players Bar Society could be a good game.